The French Alps are a wonderful outdoor playground all year round. The summer time activities are every bit as fun as the winter ski season. Here are ten great reasons to plan your summer family holiday around the glorious mountains, villages and activities of the Haute Savoie in the northern French Alps near Geneva. For years the mountains have been known as a walker’s paradise, drawing those in search of nature and tranquility. Trails exist over the vast expanse of the Alps, many of which are colour coded by markers. Guides and maps are available at Tourist Offices as well as online (and we are happy to recommend some picnic spots and panoramas!). Whether you are looking for a family afternoon outing, a day hike or multi-day treks there is plenty on offer. To add a twist to your hiking you could incorporate hiking with singing and yoga! The region is fast becoming a mecca for cyclists of all inclinations. Easy family trails, downhill mountain bike courses and road cycling through high twisting passes. The chairlifts have been modified to carry bikes as well as people, so you don’t even have to cycle uphill! It allows great access to beautiful places from where you can throw yourself down the grassy pistes or trundle through forest tracks. The bike trails are graded in the same way as ski slopes so you can choose your level. There are also a number of internationally known bike parks. Many of the mountain restaurants open for the summer season so you can take a break and re-live the moment over a cool beer at your leisure. Road bike enthusiasts know why the Tour de France features Morzine in its route planning so often. The steep climbs (and descents) can be dramatic and offer plenty of opportunities and routes to keep you exploring. For a more natural exploration go on horseback. Horses were the original means of transport but now they are primarily used for pleasure rather than carrying supplies. Equestrian centres such as Le Ranch de Morgins offer lessons for the budding rider, day hacks for the more experienced or overnight trips staying in mountain refuges for the adventurous. While the peaceful beauty of the mountains remains, there are now a dizzying variety of other activities to choose from: via ferrata (rope-wired climbing routes), canyoning in the gushing rivers, soaring in the skies paragliding, or zipping along the wires of the Fantastiable. And these are just the more exciting activities. For less adrenaline fuelled fun try fishing, either in the rivers such as the powerful Dranse or the peaceful lakes such as Lake Montriond. There are tennis courts in most of the larger villages, climb round the tree zones for the young and young at heart or enjoy a round of golf at one of the picturesque courses. Children can enjoy all of the above with the added attractions of summer toboggan runs, devil karts and swimming pools. There is no excuse for a dull moment! Whilst the mountains are covered in snow during the winter months, from early May there is a change in the air. It can be hard to imagine that just a month before the mountains were covered with skiers! As the ground warms up, shoots of grass and alpine flowers explode into life. The cows are released into the pastures and the distant gong of the bells greets you on any walk. Summers in the Alps are characterised by warm sunshine and clear deep blue skies. It is wonderful. The occasional dramatic thunder storm may roll through the mountains but they just water the pastures and clear the air. Sunscreen and a hat are very much recommended for any summer family holiday as the sun's intensity can be deceptive at these higher altitude. Interestingly, the UV exposure increases by 10% for every 3,280ft in altitude. So, at 8,000feet in elevation you are exposed to 25% more ultraviolet than at sea level. If you are careful you could cultivate a better tan than by being on the beach! The stats are impressive too. With over 260 hours sunshine during July and an average daytime temperature of around 25˚C why look any further than the pretty village of Châtel, nearby the better known, busier but equally sunny, Morzine. 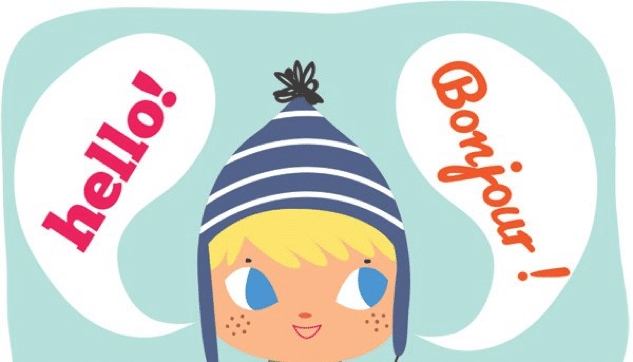 Whether you just like the fun of it or it's time to help your children with an experience outside the school classroom, there is no better way to enjoy learning a language than to actually be with the people to whom it belongs. Don't worry if you are a bit rusty, English is very widely spoken too, and any words in French are always appreciated. Who doesn't remember asking for their first "une glace s'il vous plait?" For a quick reminder here is some holiday vocabulary. Primary school aged children might enjoy this fun selection of French games and videos and if you are really keen contact the Alpine French School who run a variety of courses across the Alps. The Alpine mountain range was created 34 to 23 million years ago when the African tectonic plate pushed into the European tectonic plate. The landscape has subsequently been moulded by glacial erosion giving dramatic rock formations, glacial excavated lakes and awe inspiring mountain vistas. Children can't help but to be excited when they discover how these massive landscapes were formed. For the rest of us exploring the mountains brings them to life. The ancient atmosphere and their solid presence cannot but help to lift your soul. To explore into the depth of the geological heritage of the Haute Savoie visit the stunningly deep gorge of Le Pont du Diable, one of the 23 geosites of the Chablais Geopark. Alternatively visit the Désert de Platé near Flaine, a lunar landscape and one of the biggest lapis in Europe. The ancient limestone ocean floor has been pushed up over millennia and rainwater has dissolved the rock to form cracks, creating a network of underground tunnels. And of course, no geological tour would be complete without a trip to the Chamonix Glacier, otherwise known as La Mer de Glace. As the second largest glacier in the Alps it contains an immense 4000m cubic metres of frozen water over its 12km length. In the age of global warming, and with the glacier retreating, this is a sight not to be missed. If geology isn’t your thing, just admiring the scenery is a pleasure beyond measure while you hike, bike, paraglide, swim or horse-ride your way through the landscape. As you drive, walk or cycle through the mountains it won’t take long to find an enticing alpine lake warming in the summer sunshine. The larger lakes near the towns offer good leisure facilities, everything from sunbathing to sailing, swimming and rafting. One of best spots to appreciate the views and enjoy the water is at Combloux near Chamonix, claimed to be the first water recreation area in France. It limits the number of users to 700 to preserve its pristine waters thus maintain its environmentally friendly certification. Near Morzine, beautiful Lac de Montriond is surrounded by cliffs, mountains and forests, offering amazing views. You can sunbathe on the beach, go swimming or rent canoes or paddle boards to explore the shoreline. Another option near Chatel is Plage de la Beunaz, situated up in the mountains between Evian-les-bains and Bernex. It is a family heaven with swimming, paddle-boarding, pedalos, trampolines and zip wires. To escape from the crowds, try Lac des Plagne located in the Val d’Abondance, near the end of the road turning off from Abondance, heading up the side of Mont de Grange. In a peaceful location it has walks exploring the ancient chapels and trout fishing. In summer time there is a pleasant café bar open nearby. For something a bit different, canyoning and rafting are also growing in popularity in the cool rushing rivers of the Alps. Children can do these but check with individual companies as each have their own age and height restrictions. Frogs Rafting offer similar activities. What could be more French than sitting at a checked tablecloth with a basket of bread and a bottle of wine, while watching the world go by? There are plenty of restaurants to choose from across the region, in the mountains and through the villages. There are the more formal such as Vieux Four in Châtel or fine contemporary such as La Chamade in Morzine. There are restaurants with particularly fine views such as La Haute-Bise high up on the Col de Bassachaux and restaurants on beautiful walks like Cantine de They above Morgans. After walking for a morning there is nothing better than seeing a refuge in the distance and enjoying the aroma of fresh cooking wafting through the air. The mountain restaurants have plenty of space outside so children can enjoy burning off any energy they may have left after their morning walk while the parents sit back and relax. Long lunches of creamy tartiflettes, fondues and raclettes are just the thing in winter but their popularity extends to the summer months too. For something more seasonal be tempted by the salads, from warm goat's cheese to charcuterie to a simple green salad with tangy vinaigrette. Don't forget a glass of the local wine to wash it down - you're on holiday! The wines of the Savoie used to be the poor cousin of the more famous appellations to the south and east. However over the last few years, with some dedication by local grower and using modern techniques, the variety and quality of the wines have improved greatly and they are starting to be recognised in their own right. The commonly grown grapes are the Jacquère and Altesse whites and the red Mondeuse. The cold weather and glacial soils create distinctive flavours characteristic of the mountains. The whites, which are more abundant in the region, are typically light and fresh, some would say with a bouquet of the mountain meadows! The Mondeuse is a great accompaniment for the local cheeses, being rich and slightly tannic. Take time to sample the range or visit some of the wineries that welcome vistors to their vineyards and cellars across the region. With dependable warm weather in the summer and beautiful surroundings the mountain landscape is a perfect spot to enjoy a picnic. The scents of the wild meadow flowers and pine needles pervade the open spaces making an exploration on a sunny day a joyful experience. To find some special picnic spots you have to investigate a little further than the local tourist offices. There are usually some helpful guide books for local walks available and many more trails are marked by posts over the mountains. 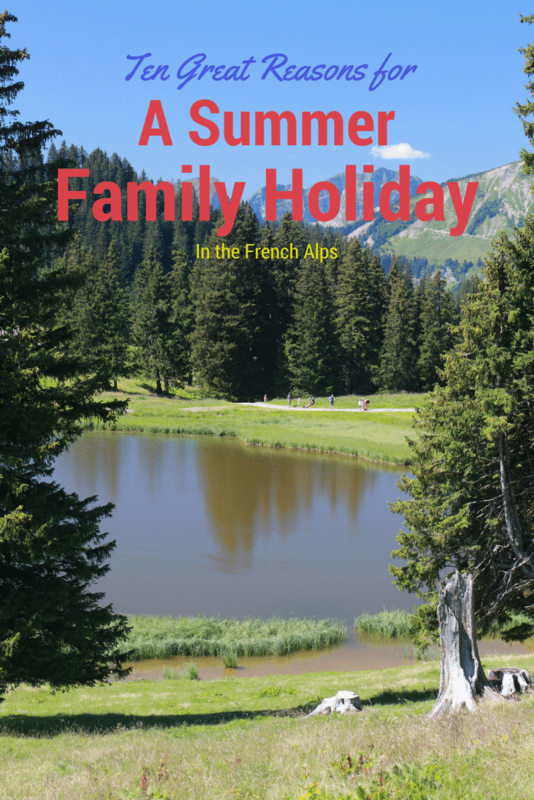 Our family favourites are based around the pretty market towns of Châtel and Morgins. There are some lovely places that are relatively easy to reach: Lac de Conche above the Super-Chatel gondola or the high meadow facing the snow capped Dents du Midi at the top of La Folleuse lift from Morgins. With a feast laid out on the grass, children love the freedom to run around and adults can enjoy relaxing with an informal meal. If you plan it well, little ones can be encouraged to walk further than usual with the lure of a picnic at the end of a morning's exploration. And no two picnics are ever the same. Almost all the towns have local shops selling freshly made breads, local cheeses and charcuterie. And for those with a sweet tooth there are always some yummy patisseries to savour. But best of all, even the simplest picnic tastes fabulous in the fresh mountain air! The alpine villages love to put on a show and there is a continuous stream of festivals through the summer. They are great fun events often blending traditional crafts with new boutique produce with a good dose of fun thrown into the middle. Don't be surprised to see accordions, log sawing competitions or rows of fine alpine cattle, finished off by fireworks or a performance in the village square. It's all there! Each of these events has its own local character however as they are well known the advertising can be similarly low key. Keep your eyes open for flyers and ask in the local Tourist Office. The Pass’Ports du Soleil, over the last weekend of June, is an 80km mountain bike tour. It covers France and Switzerland over two days, passing through many villages of the region. It can be a race or a family event - you choose. 6,600 riders participate with fairs and entertainments along the way. The Spartan Race in Morzine at the beginning of July is a mammoth obstacle course and a great spectacle. With junior, adult and team categories sign up in advance to compete or turn up on the day to watch the fun. Mid August sees La Belle Dimanche in Châtel; a mountain festival to celebrate shepherds, cows and all things Alpine. It's huge! Take the Pierre Long chairlift, which runs for free for the event, up to Plaine Dranse. No long-haul flights on this holiday! There are many routes into Geneva, Chambéry and other French airports from across the UK. And it is not too far to drive either. Car hire in France is straightforward if desired or transfers are easily arranged from the airport to the villages. Most accommodations will be happy to help with this. Enjoy stress free travel on your summer family holiday this year! Many of the lovely ski chalets of the region are also open in the summer, offering self-catering, B&B, 'chef to your door' as well as full catered service. However with fewer people in the summer months the accommodation is significantly cheaper than in the ski season. You can book fantastic traditional alpine farmhouses with fully modern facilities for your private use.